The Montreal Protocol on Substances that Deplete the Ozone Layer (a protocol to the Vienna Convention for the Protection of the Ozone Layer) is an international treaty designed to protect the ozone layer by phasing out the production of numerous substances that are responsible for ozone depletion. It was agreed on September 16, 1987, and entered into force on January 1, 1989. Every country in the world is a party to the Protocol. The Montreal Protocol has successfully phased out or is in the process of phasing out several key classes of ozone-depleting substances, including chlorofluorocarbons (CFCs) and hydrochlorofluorocarbons (HCFCs).The table below gives you an overview of the Convention. Class I substances: Substances have an ozone depletion potential (ODP) of 0.2 or higher, and include halons, chlorofluorocarbons (CFCs), methyl chloroform, carbon tetrachloride, and methyl bromide. Class II substances: Substances that have an ozone depletion potential (ODP) less than 0.2, and are all hydrochlorofluorocarbons (HCFCs). Different phase-out dates have been set for CFCs, Carbon tetrachloride and HCFCs. Most of Class I substances have been phased out up to date (2015). Please click here to find out the phase-out dates for different types of ozone-depleting substances. 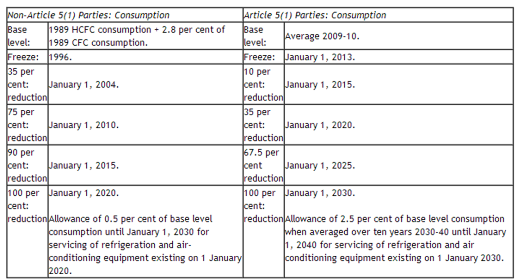 Parties to this Protocol agreed to set year 2013 as the time to freeze the consumption and production of HCFCs. They also agreed to start reducing its consumption and production in 2015. The time of freezing and reducing HCFCs is then known as 2013/2015. The goal is to phase out HCFCs completely by 2030. The table below shows the phase-out plan for the consumption of HCFCs. HFCs are intentionally made fluorinated compounds and used as replacements for CFCs and HCFCs. HFCs pose no harm to the ozone. Yet most HFCs are potent greenhouse gases. For example, the most commonly used HFC, HFC-134a, is 1,430 times more damaging to the climate system than carbon dioxide. The Montreal Protocol does not address HFCs, but these substances figure in the basket of six greenhouse gases under the Kyoto Protocol. The Montreal Protocol has a big impact on companies who produce ozone-depleting substances and those who use them for the following applications: refrigeration, air-conditioning equipment, foam products, aerosols, fire protection system and solvents. Since the production and use of CFCs have already been banned in most countries since 2010, the immediate impact of the Montreal Protocol is on those companies who still produce or use HCFCs. Parties to the Protocol usually have their own regulations to address ozone-depleting substances. Usually, authorities will impose a strict quota on production or import and reduce that quota gradually. In addition to that, authorities may impose additional license, reporting and labelling requirements on producers, exporters, importers and users. Business operators shall check their own legislation for detailed requirements.